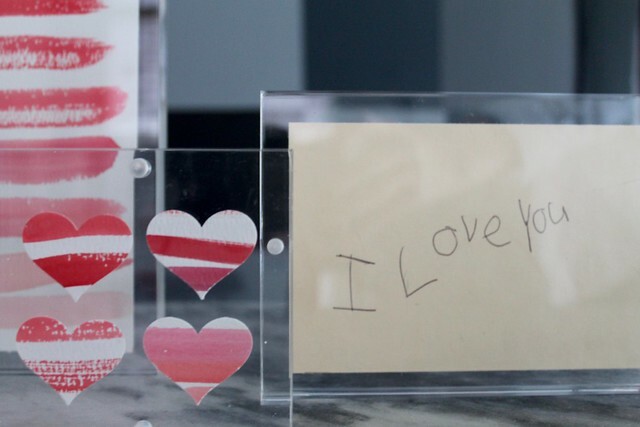 Here is a simple project for diy Valentine art using lucite frames. 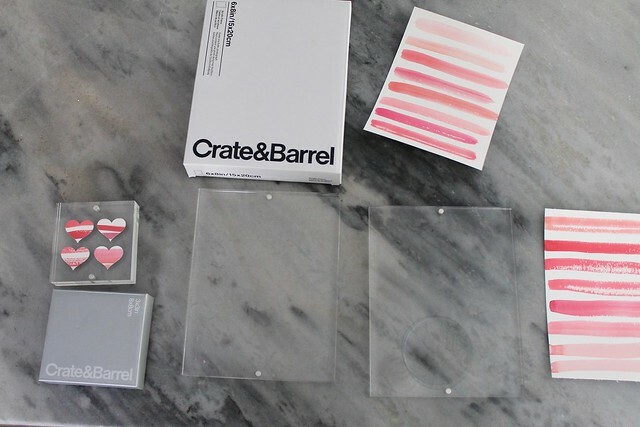 I love these Lucite frames from Crate & Barrel. For the large piece I cut the watercolor paper to the right size (6 x 8) and then painted stripes. I usually paint and then cut the paper, but I wanted it to look like it was for this specific piece. For the small frame, I used a heart punch and cut out hearts creating tiny abstract hearts as you move around the paper. I’ve saved “love notes” from my kids over the years. These of course were from when they were tiny—and they make me so happy. So why not preserve them and frame them? Together they create a little Valentine art. 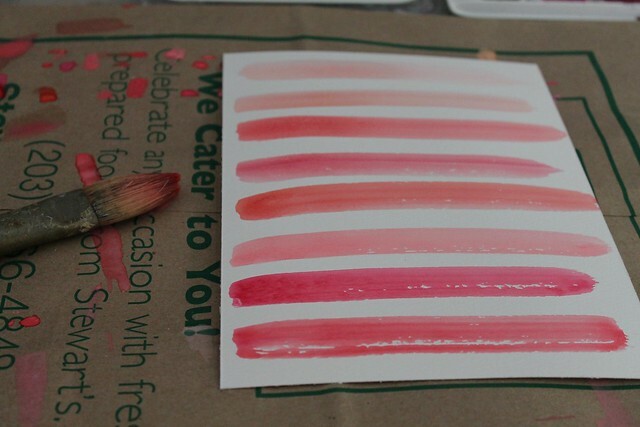 Paint stripes or an abstract on paper cut to fit the frame. With the leftover scraps, cut out hearts using the punch. 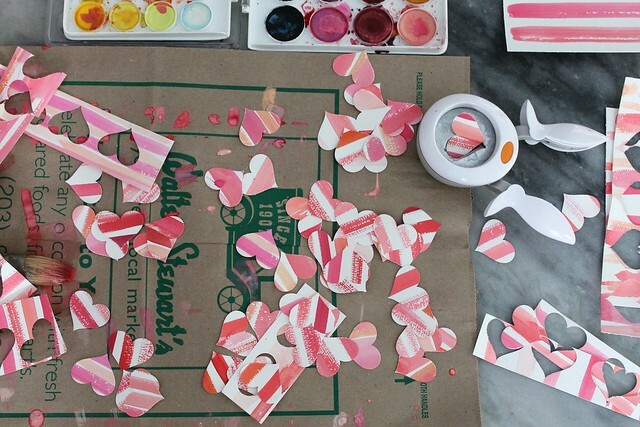 As you cut one row, cut the paper and start again moving and rotating the punch in different directions to create unique painted hearts like these. 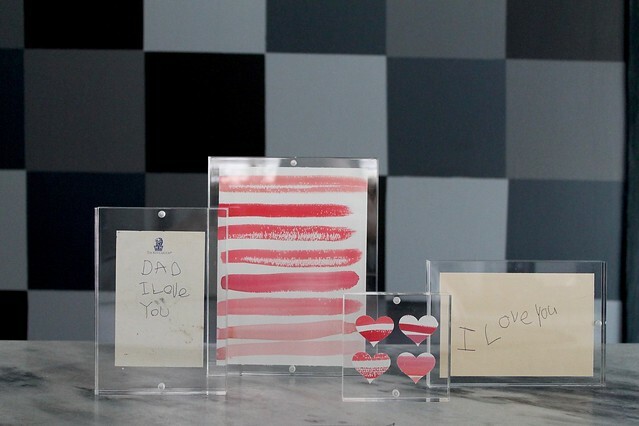 These Lucite Frames come in several sizes and it takes about 2 seconds to frame a piece of art, notes, cards or photos. It’s easy to change them out and mix things up. Having a black and white house makes it especially easy to decorate for any holiday. 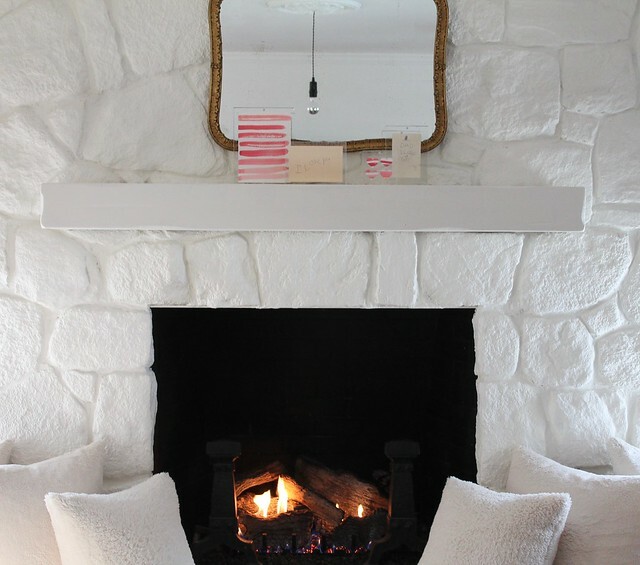 I always use Cloud White Paint by Benjamin Moore and you can read more about our painted stone fireplace here and here. I’m crazy for stripes, so I love this!! So sweet. I love the “I love you” written by one of your children(?). Yes, one by my daughter that I’ve had on my husbands dresser for years and then over the holidays I discovered the note on a file folder with Christmas card addresses on from years ago. I was so happy to have found it—now that he’s 17!